As a new school year begins, everyone and everything starts to change. Can Zoey keep up? Includes “Sew Zoey” blog posts and fashion illustrations. In the ninth book in the Sew Zoey series, quite a few people have a change of heart—and clothes. One of Zoey’s frenemies asks for Zoey’s help choosing a back-to-school outfit. Zoey’s friend Priti shows up to school with a new look and gets mixed reviews. And Kate is nursing a swimming injury, so she suddenly has tons of free time…and wants to spend it with Zoey. But between helping her frenemy and attending fittings for a tween TV star who wants to buy one of her outfits, Zoey is too busy. Kate fears that Zoey is changing. Could she be right? Can you believe school starts next week?! Summer vacation always seems so long at the beginning, and then, at the end, it seems like it flashed by in an instant. All of a sudden it’s about to be over, as if time magically starts to speed up in August. It’s been a really fun summer, getting to visit Daphne Shaw’s studio, going to sleepaway camp for the first time, and taking a screen-printing class, but there’s something exciting about starting a new school year, too. I’m designing a new outfit for the first day of school, but I’m keeping that under wraps for now. Instead, here are “the long and the short of it” skirts inspired by how I feel about time this summer. I hope you like them! The problem with Marie Antoinette was that being a headless dress form, she wasn’t very forthcoming with her opinion. Zoey sighed and looked at the pictures she’d printed out after watching a movie from the 1960s. They were of an Italian actress wearing a wide-legged halter-top jumpsuit. Zoey’d thought it was such a cool and different look, perfect for her to update with Zoey magic. But now, comparing the sixties outfit to her sketch, she wasn’t so sure. Just then the doorbell rang, interrupting her musings. “Hey, Zo! The Holbrookes are here!” her brother, Marcus, announced from the bottom of the stairs. Zoey slipped on her flip-flops, grabbed her purse and cell phone, and ran downstairs. She had a mall date with one of her best friends, Priti, to help her shop for a new back-to-school outfit. “See you later, Marcus!” she called on the way out the door. “You can say that again,” Priti said with a sigh. She was still adjusting to the idea that her parents were getting a divorce and to the fact that her dad had moved out of the family home. “Uh-huh. Sure,” Priti agreed without any of her normal bounce and enthusiasm. Zoey wondered what was going on—had Priti and her mom had a fight before she had gotten into the car? She spent the rest of the ride to the mall describing how she came up with the idea for her back-to-school outfit and asking Priti and Mrs. Holbrooke what they thought about the idea. “That just means I have more of a reputation to keep up!” Zoey said. Mrs. Holbrooke pulled up outside the mall. The girls browsed a few of the popular chain stores before ending up at their favorite clothing shop, My Best Friend’s Closet. 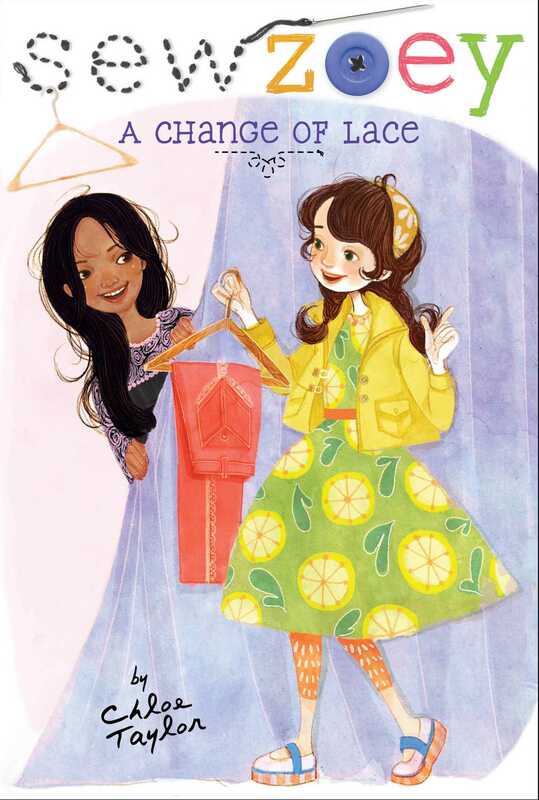 While Priti browsed, Zoey picked out a few outfits she knew her friend would love—colorful clothes, sparkly accessories, an adorable belt with a fake jeweled buckle. She walked over to the display rack where Priti was standing. “Sure,” Priti said, taking the clothes from her. But Zoey noticed that before she walked to the dressing room to try them on, Priti grabbed a bunch of black clothes off a rack where she must have placed them while she’d been browsing. That’s odd, Zoey thought. Her friend was usually the queen of bright colors. Priti came out wearing the first of the outfits Zoey’d picked for her. “It looks awesome!” Zoey said. Priti looked at her reflection in the mirror. Zoey waited, wondering what Priti didn’t like about the first outfit, which looked really good on her. The second outfit looked even better on Priti than the first. “What do you think?” Zoey asked. When Priti went to the register to pay, all the clothes she was carrying were completely . . . black. Zoey was surprised. Seeing a striped scarf hanging nearby, she took it from the display and draped it around Priti’s neck. Priti shrugged and removed the scarf from around her neck, placing it back on the display. “What about the jeweled belt?” Zoey suggested. As Priti paid for her purchases, Zoey wondered what was going on with her friend. Maybe Priti wanted to experiment with her style, and there definitely was nothing wrong with that. Zoey was all about being adventurous with clothes. It was just . . . going from glitzy to goth seemed pretty dramatic. On the other hand, Zoey thought, Priti had always had a flair for the dramatic. After they got their food, the girls were looking for a table to eat at when Priti hissed, “Zo, is that Shannon Chang over by Lola’s Lattes?” Shannon was friends with Ivy Wallace and Bree Sharpe, girls who often teased Zoey and her friends at school. They found a table on the opposite side of the food court, next to a pillar, so they were out of sight. Or so they thought. A few minutes later, Zoey caught sight of Shannon heading straight in their direction. “She’s coming over here,” she told Priti in an undertone. “I don’t know!” Zoey whispered. They watched Shannon wind her way toward them, carrying a bag from a pricey designer shoe store. “Right,” Shannon said, her cheeks flushing. Zoey and Priti exchanged furtive glances as Shannon stood by the table in an uncomfortable silence. It was obvious she wanted something—but what? Priti, who’d just taken a sip of soda, started coughing. Zoey figured Priti was as taken aback as she was that Shannon Chang was asking her for fashion advice. “Um . . . okay,” Zoey said. Priti, who’d recovered from her coughing fit, gave Zoey a What are you doing? look. “How about we meet at Urban Chic in, like, fifteen minutes?” Shannon suggested. Zoey wasn’t 100 percent confident about Shannon’s motives, but she didn’t think she’d go that far. “Kate reads Sew Zoey, and she doesn’t care that much about fashion,” Priti argued. Shopping with her former best friend and one of her current BFFs was seriously awkward, Zoey decided. Shannon acted as if Priti wasn’t there, while Priti kept giving Zoey See, I told you looks. “How about this?” Zoey said, holding up a cute denim skirt. Priti sighed, loudly, and checked the clock on her cell for the third time in ten minutes. Shannon finally acknowledged Priti’s existence by giving her a dirty look. Zoey was beginning to wish she were at home working on her own outfit instead of helping everyone else with theirs. She found a pair of capris in a vivid cobalt blue and showed them to Shannon. Zoey definitely wished she were back at her worktable. She wasn’t having a good time. Not at all. Priti checked her cell again. Priti was behind Shannon, shaking her head so vigorously that Zoey was afraid Priti was going to hurt her neck. But there must have been something of the old Shannon in the request, because Zoey found herself saying “Sure, it’ll be fun” and arranging to meet Shannon at two the next day at My Best Friend’s Closet. On the ride home, Priti went even further. “You should call Shannon and cancel your plans for tomorrow,” she urged Zoey. “You shouldn’t be encouraging your friends to lie, Priti,” Mrs. Holbrooke admonished. “Wanting to protect your friend is a good intention. Telling her to lie . . . not so much,” Priti’s mom said. When Zoey got home, she wasn’t sure what to do. Deep down, she shared some of Priti’s concerns about Shannon’s sincerity and wondered why her old friend suddenly wanted her advice after being distant for so long. But they’d had a good time in their class together during the summer. Maybe there was a chance they could patch things up, even if they weren’t BFFs anymore. After getting a snack, Zoey picked up the phone and called Kate. She explained her dilemma and asked what to do. Zoey thanked her for her opinion, but inside, it just made her feel discouraged. Next she called Libby. Zoey was surprised that Libby seemed to agree with Priti and Kate. When they said good-bye, Zoey had a sick feeling in the pit of her stomach. It was true. Shannon hadn’t been much of a friend over the last year. Shannon had watched and even joined in when Ivy and Bree were being unkind to Zoey. “Everything okay, honey?” her father asked at dinner. Zoey was uncharacteristically quiet. “Well, you know what we say in sports—no pain, no gain,” her father said. “It’s like that with relationships, too. There’s always a risk of getting hurt, but if you don’t give people the benefit of the doubt, then you might miss out on the good stuff, too,” Mr. Webber explained. “So you think I should go?” Zoey said. Being pranked by Ivy? Being laughed at? Zoey thought about what her father said, and realized that maybe she should just be brave and give Shannon the benefit of the doubt.